Successfully Added Youtube Ready 1080P Full HD Media Player to your Shopping Cart. 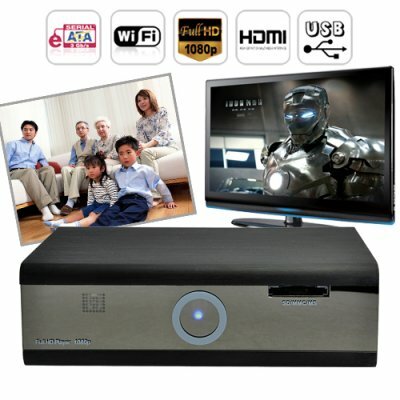 Take your home theater experience to the next level with this Youtube ready, Full 1080p HD media player. Stream or playback all of your favorite multimedia content and watch youtube videos on your big screen TV. This HD multi media player is capable of playing almost every video format you can download or rip from the internet, MTS, TS, TP, MKV, AVI, WMV, MPG, DAT, MOV, VOB, MP4, FLV (just to name a few!). The output is high definition up to 1080p with HDMI. You can also choose AVI, YpbPr and coaxial Spdif connections to match your AV system. With the Youtube Ready 1080P Full HD Media Player you have full access to digital video, audio and photos stored on an installed HDD, USB and SD card and local area network. Want to watch a Youtube video or the latest movies inside your PC on your 42 inch HD LCD TV in the living room while you are lying on the couch with a remote and some potato chips in your hand? Hook the E65 Youtube Ready 1080P Full HD Media Player up to your computer network or the internet via the Wi-Fi dongle and you will never want to turn off your TV ever again. You can also get the latest update of all news and weather around the world without leaving your living room! Unlike most HD media players, which only support one internal hard drive, the E65 Youtube Ready 1080P Full HD Media Player can support 2 HDD devices. It has an additional external SATA HDD connection as well as one for an internal HDD. So you don't have to unscrew and open the case every time you want to change a hard drive. To make things even easier, the E65 also has a file copy function so that you can transfer your favorite media content to and from your local area network and onto your USB, SD cards and hard drives. This function is especially useful if you have some large HD media files or long recordings that are difficult to move with standard USB flash drives or SD cards. Our factory direct wholesale price makes the E65 Youtube Ready 1080P Full HD Media Player the first must have HDD entertainment gadget of 2010. Start enjoying all your favorite videos, movies, latest news and much more in style! Order yours today and we will express ship it out to you tomorrow. - Video : MTS, M2TS, TS, TP, MKV, AVI, WMV, MPG, DAT, MOV, VOB, MP4, FLV, IFO, BD-ISO, DVD-ISO. - 1 x WiFi USB Dongle included to be connected to USB host slot for wireless (802.11 B/G)network. Who needs the E65 media player? Anyone who is tired of boring normal TV programmes and looking for possible ways to expand TV capability to watch everything stored on local area network or the internet, and able to check the latest news and weather. Why is it important to have the file copy option? Normally, transporting media content requires you to have an extra portable storage device such as an USB or SD card, and physically move the portable device to transport the files, not to mention that files in excess of 32 GB are impossible for most USB drives and SD cards. The file copy option let your fingers do the walking and have more time enjoying the media content. I previously owned a Buffalo Media Theather system, not quite as goos and a lot more bulky. This unit is very compact, can have two SATA hard disks, one 2.5 inch internal, and one external. File transfer utilities are very easy and just imagine to have houndred of movies in a box about the size of your hand. Playback qualitiy is exceptionally good. This model can even be upgraded to have live feeds from China TV (and I suspect from others countries, but haven't had the time to investigate) and some other features, like Bit Torrent. Strongly recommended for movie fans. I'm not using bit torrent or ftp with this device -- maybe I'm a simple user. But I installed a 2.5" HDD, loaded my videos & it's great. As others say, v. good video quality & easy to use. After following the readme.txt instructions for formatting the HDD (which loads bt & samba as noted in another review) the ddeice displays as an external disk drive in Windows & I just drag & drop content to the internal HDD. Really easy to use. No problem with the connections for me - standard RCA jacks, HDMI, coaxial & optical port all available. I only wonder what will happen if / when the remote breaks -- there is no other way to control the unit. Can I get another one somewhere? Or find out it's compatibility with pre-defined "universal" remotes? Summary: For what I wanted the media player is excellent. Formats I want (avi mkv mp4) supported plus many more; simple connection to PC & TV. Good quality output on TV (I use HDMI connection). An excellent product. Service was great too. Received in New Zealand less than a week after ordering. Couldn't be happier! Отличный аппарат. Заказал еще один для брата. does not say anything about the connections. Anyway after connecting it in all possible ways it finally worked and it works very nice even pictures downloaded wire less from my laptop was a breeze. the clarity is amazing, much clearer than on the laptop screen. You have to get used to the remote controller but once you understand it its easy to watch download and setting up new features. Really fantastic player.